If you want a real workout and your dog could use a bit of one himself, then get thee to the nearest Thank Dog! Bootcamp, or get one started yourself! While you do your crunches, push-ups, sit-ups and whatever else your certified boot camp trainer has in store for you, Fido 'goes to his place.' Fido gets trained to go to his place. 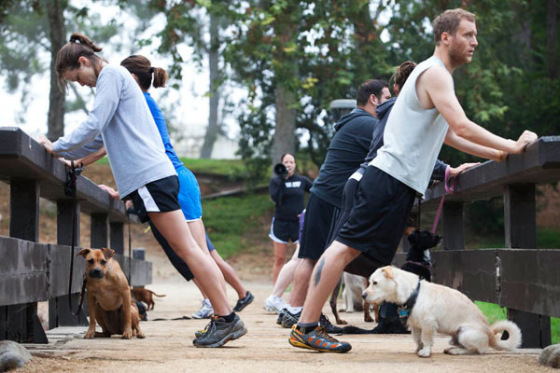 In fact, Fido not only gets a workout, mostly running along side you as you jog, but obedience training as well. The idea for Thank Dog! Bootcamp came to twin sisters, Jill and Jamie Bowers, both trainers - one owned a gym and the other owned the Thank Dog! Training business. Pounding away at a model for training dogs and humans, they developed the Thank Dog! Bootcamp for dog and owner. Their Bootcamp opened in Burbank, California; now there are licensed Thank Dog! Bootcamps in Boston, Washington, DC, Cleveland, Ft Collins, and San Diego. Thank Dog! Bootcamp is available to license in the U.S. and Canada. The Bootcamp Academy has a special training program for licensees to prepare them to train others and to set up your own Bootcamp - all income from the business is yours to keep. If you want to participate in Thank Dog! Bootcamp with your dog and your iPhone, guess what? There's Thank Dog! Bootcamp app! Whether you participate in this wonderful excercise program with your favorite partner, or you start your own business, licensing Thank Dog! Bootcamp, it doesn't look like you can miss with these opportunities.